Thursday 5th March, 7 p.m.
Friday 6th March, 11.00 a.m. It is with great sadness that the Apostleship of the Sea has heard of the death on 27th February of Fr John Seddon, a cruise chaplain with the Apostleship of the Sea for more than two decades. Before being ordained a priest for the Archdiocese of Liverpool, Father John worked for the Inland Revenue and was in the Royal Navy Reserve. He became AoS port chaplain to Liverpool in 1989 and undertook his first cruise the following year. Since then he served on more than 25 cruises, his last was on the Aurora during Easter 2014. In a 2012 article in the Daily Telegraph highlighting his cruise chaplaincy Fr John recounted, "For some of the crew, the presence of a priest brings great comfort. We held Mass to celebrate the birth of one crew member’s baby. On the other side of the coin, there might be bereavement, so I make arrangements to offer prayers. A crew member lost several members of his family back home in a bad road accident. The deputy captain asked me to celebrate Mass for them, which all the officers attended." John Green, Director of Development at the Apostleshop of the Sea said, "He was a great friend, confidante and advocate for those who work on cruise ships. We offer our sympathy and prayers to his family. 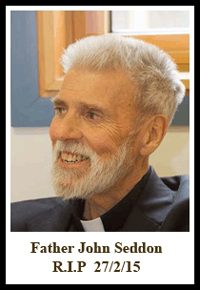 Fr John will be greatly missed by countless cruise ship crew and the Apostleship of the Sea." Mary Fenerty, who worked as a Catholic Lay Chaplain alongside Fr Seddon said, "Father John Seddon will be sadly missed by the Scouts, his work in the parish of St Peter and Paul in Crosby where he spent the last 17 years and not least, by the many seafarers who visited the Port of Liverpool."